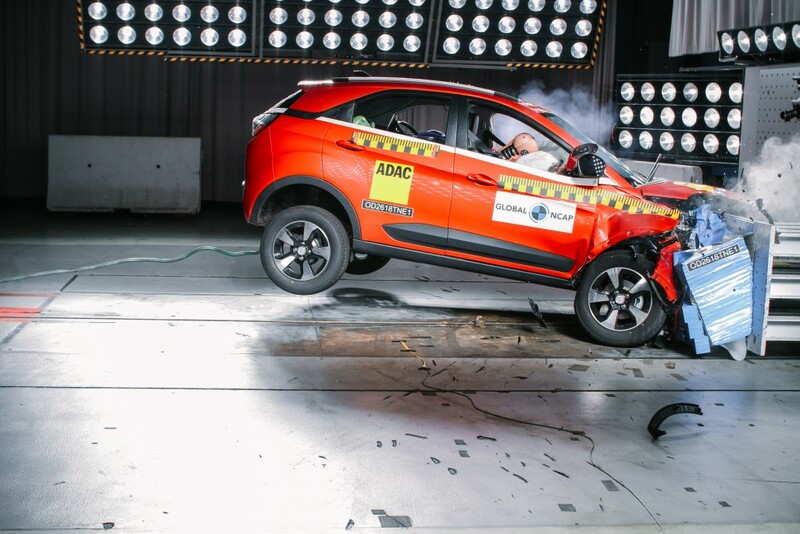 Global NCAP awarded four star rating for Tata Nexon in the recent round of crash tests. The Indian manufacturer offers dual airbags, ABS and ISOFIX anchorages as standard on all variants, which helped the compact SUV to secure four star rating for adult occupant protection and three stars for child occupant protection. The body structure of Nexon has been rated as stable at 64 kph off set deformable barrier crash test. The Nexon offered good protection for head and neck of driver and passengers along with adequate protection for their chests. The rearward facing Child Restraint System (CRS) with ISOFIX anchorages gives good protection for 18 month old child. The forward facing CRS also gives good protection for head but chest protection is limited. The A-Pillar of Nexon retains its structure and doesn’t collapse under crash, which is very important for passengers and body shell can take more load as most of the crash force was absorbed by front crumple zone along with engine compartment. Tata Motors has also used high strength materials for the construction of Nexon, which helped the compact SUV to perform really well in these tests along with standard safety features. Tata Zest has also achieved four star rating from Global NCAP in 2016 along with Volkswagen Polo and Toyota Etios Liva. Global NCAP launched #SaferCarsForIndia Campaign in 2014 as they want to promote safe cars and this has led to Bharat NCAP programme. The first ever World Congress of Global NCAP will be hosted by Delhi in September, 2018. We are expecting other manufacturers to offer safety features as part of standard equipment to make our roads safer. Tata Motors officially launched Nexon last year and the compact SUV has been very well received by customers. The company has recently expanded its lineup by introducing AMT transmission option on Nexon as it was earlier only available with manual gearbox. Tata Nexon is powered by both diesel and petrol engines. The Nexon is priced between Rs. 6.29 lakh and Rs. 10.70 lakh (Ex-Showroom, Delhi).